Read this entire site before requesting to book. Submit questions via "ask a manger or owner questions" first. Doing these two steps will assure you are getting a great fit for your needs. Especially when booking for summer season. * We live nearby and are able to personally greet you upon your arrival and give you the lay out of the rental and information about our community. We will ask you questions which will be required to answer before any reservation is completed. A contract will be sent to you and a copy if a government ID must be submitted matching the reservation, the payment and the contract name. This contract must be received with in 48 hours of the reservation. After these steps are completed, we will confirm your reservation. One payment for all reservation due at time of booking. ~For your benefit, ask all questions before booking. You can reach us on HomeAway under, "ask Manage/Owner a question"
Our property is listed on multiple sites, for consistency, the polices, terms and conditions listed on this document/contract shall prevail and supersedes any and all other polices, terms and conditions described on the listing and booking site that you originally inquired and/or booked this property. We own and manage several properties on HA/VRBO, and care about the personalized experience we provide for you. We have other choices listed on HA/VRBO for you to choose from. The Kingfisher is a Water and Beachfront Vacation Beach rental in Mission Beach, Beachfront bayside, perfect for vacationers looking for a gorgeous location, peaceful beach and close to all the wonderful activities we have to offer. We can also offer you other choices via HA and possible discounts if you contact us then you can easily use HomeAway's and VRBO's easy online reservation process. Choosing a vacation rental or home can be a big decision. To ensure you choose the right rental for your stay is important to us as well. Our service, for you, is personal, and we do speak to each vacationer personally, before confirming a reservation to ensure you are choosing the right rental/ home and location you are looking to stay. Our spacious newly renovated and updated, 2 bedroom serene waterfront beach front bayside rental, The Kingfisher is located right on the beach, bayside. This is the quieter side of Mission Beach, which many people seek away from excitement of the ocean front. Our rentals and beach front location works well for singles, couples, and small families who are looking for a quieter beach front experience away from the crowds. Our rentals cater to that relaxed experience and type of renters. Families with small children especially love our rentals and location. You can play all day, and unwind in the evening and have the peacefulness of the bayside for sleeping. We offer this charming and spacious 2 bedroom waterfront beach rental which is located right on the peaceful bayside beach sand. All Mission Beach properties, are very close to each other, so its important to choose the right location for your needs. The Kingfisher, best suits vacationers who want a more low key vacation in a more mellow area of Mission Beach. Kids can play all day on the beach, then have the quieter evenings for sleeping after that long day. We do offer monthly rentals, Oct, Nov, Dec, Jan and February. We do limit monthly rentals in our one bedroom, to 4 guests. Please check our rate chart for pricing on our nighty, weekly and monthly rates and choices. Watch the glorious sun rise from your own private patio on the beach front or walk five minutes west to catch the action of the Pacific Ocean. This vacation spot, is uniquely set in Mission Beach which is located between the mighty Pacific Ocean and quiet scenic Mission Bay. Step out your Bay Front patio door right to the sand. Put on your skates, hop on a bike or leisurely walk for miles on the boardwalk located along the water. You can rent almost any thing you need with in a 5 minute walk. World class surfing, sailing, golfing, and fishing are all easily accessible from your unit. The Kingfisher, is kept well maintained at all times, which allows us to keep it in top condition while being kept welcoming and impeccably clean. La Jolla, Sea World and the World Famous San Diego Zoo are all minutes away. We offer many amenities for your comfort. : Our kitchen is fully stocked for your cooking pleasure. We even include: Dish soap, paper towels, laundry soap, plastic wrap, aluminum wrap, spices, assorted teas just name a few of the extras for your convenience and pleasure. The Kingfisher has cable television, and DVD. All linens and bath towels are provided with 4 pillows on your comfortable King bed and two pillows for each twin bed. Beach towels and beach chairs are provided to ease your load and get you ready for your days in the sand. •	The master bedroom has a wonderfully comfortable king bed with crisp cotton sheets and linens. It also has its own powder room. with a 1/2 bath comes with a very comfortable king bed for your comfort and is decorated with colors reflecting the sand and the sea. •	Sofa Sleeper for the extra 5th guest. •	Bathrooms include a 3/4 bath and a 1/2 bath in the master bedroom. The Kingfisher’s living room opens to your own private gated patio and the sandy beach. Open the gate and there you are - At the beach, no better place to vacation with friends or family wanting a wonderful peaceful place to stay. If you are looking for that beach experience, come and discover the uniqueness of Mission Beach in the heart of America's Finest City, San Diego. Swimming, sailing, surfing, skating, biking, golfing, fishing and sight seeing are just a few of the activities at your doorstep. Sea World is 5 minutes away, Mexico is 17 miles to the south, Disney Land is 2 hours to the North and the World Famous La Jolla is a 10 minute drive from your door. You are walking distance to waterfront dining, or casual beach eateries. You can easily shop for groceries, and plan your own picnic or romantic meal while sitting at the beach and watching the sunset on the glorious Pacific Ocean. Mornings are breath taking as you wake up to the sunrise across the water from your own patio table. Sip your coffee or tea as you watch the the first glimpse of dawn across the water and relish the quiet and peace that is all your own on the bay front. We are a smoke free and pet free vacation home, so this would be suitable for those who have allergies for those types of allergens. If you are interested in The Kingfisher, please give us a call or email us for any questions. We like to personally speak with each vacationer, if possible, before confirming any reservations. Personal service is how we have had such a positive experience for our rental career. Small personalized friendly service is a our business motto. We are individuals who own and manage vacation rentals for ourselves and a few neighborhood properties. With a long time family history in San Diego going back to the turn of the century, combined with roots from the midwest, we have both pride in San Diego, and good old fashioned values. The rentals showcased on this site, reflect, our goal to provide you with quality accommodations, along with personal service from the start of your reservation process, to your final departure. We like to think we attract vacationers who appreciate receiving the exact rental that is advertised on our websites and desire a well maintained vacation home or rental that much care has been taken to provide. In return, appreciate and care for the rentals during their stay. The environment we provide and the bayside in Mission Beach is perfect for low key vacationers, who want an amazing location on the waterfront and coast. We take each reservation personally over the phone to assure you are choosing the best rental for your needs. After 25 years of owning vacation rentals and managing, we have found it to the key to success to have personal experience for both you and our selves. Its lovely, recently renovated with a very cute Pottery Barn style. The Kingfisher is well cared for and always impeccably clean for each arrival. Its located on the beach front bayside and perfect for couples, small families or friends looking for a low key vacation rental in a very nice area of Mission Beach bayside. Benefits are easy to name: A great location on the waterfront. A well cared for rental and meets the standards of your expectations. Personalized service, so you know what to expect and will have no surprises when you arrive. There is one 3/4 bathroom and one powder room, commode and sink, for bathrooms. The quieter bayside beach is a welcome place to vacation with the choice just across the street for the mighty Pacific Ocean. Your front door opens to the beach and waterfront bayside. Its the best Mission Beach has to offer. The Kingfisher is located both on the waterfront and beach bayside....Perfect for families or couples. The Beach and Water are your front yard! Sit by the water and read or watch the kids play for hours. The location is amazing. A lovely Pottery Barn style living room which looks out on the beach and waterfront. 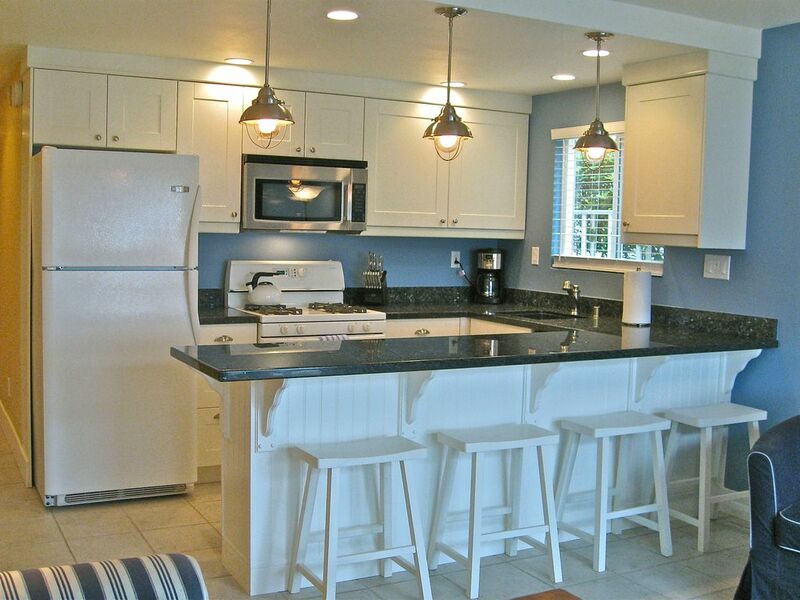 Great Kitchen which looks out on the beach front bayside. Gorgeous new renovations. Seating at the kitchen bar for 4 and the outdoor patio for 6. This rental is great in the summer for 6 and 4 to 5 in the off season. First and foremost our best amenity is our location on the beach. But, when you have had a fabulous day at the beach or exploring wonderful San Diego, you come home to a beautiful vacation rental. We do provide beach chairs and beach towels along with kitchens supplies to get you started for your stay. Our rentals are kept in immaculately clean condition and well maintained to ensure your enjoyment and comfort. We take great pride in our presentation. Your livingroom has a flat screen TV for your enjoyment and we provide wireless internet service. This unit has one reserved parking spot on the property. It will accommodate a medium sized vehicle. Please ask to see if your vehicle with fit in the space, you must fit between the white lines. If you have a large vehicle, there is free public parking lot nearby that will accommodate larger vehicles. Arrival Time is 4:00 P.M. we can try to accommodate an earlier arrival from Oct to May only. Our family of 4 just returned from 8 days in beautiful Mission Beach. Cyndi met us at the condo at check in and spent 10 minutes showing us around and giving us great info on nearby restaurants, grocery store, coffee shops, etc. She was super helpful and very sweet! The condo was very clean and just as described. There are plenty of towels, linens, kitchen utensils, beach chairs, beach toys, dishwasher pucks & a good supply of toilet paper. My kids ages 4 & 5 LOVED having the sand right in front of the condo (as did Mom & Dad). It's a very quiet and safe area. We were able to walk to many places, which was nice and drove to Sea World, The Zoo, Lego Land, La Jolla & Ocean Beach, which were all super fun. There is so much to do in the area. We did do a handful of laundry loads because of our kids being wet and sandy from the beach. It was SO nice having the washer and dryer on site. We can't wait to plan another family vacation in Sunny San Diego. Thanks Cyndi for such an awesome vacation. Unfortunately I was unable to join my family for this trip to San Diego due to health issues. My family raved to me about the location of this house. Couldn't ask for a better start to your day than sitting in the patio with your morning coffee and enjoying the sights of the bay. And a 5 minute walk to watch the waves on the ocean side. Cyndi couldn't have been nicer. What a fantastic women she is. Cyndi called me the day we were due to check in and I explained to her that I wasn't able to be there. Told her my family had just landed and gave her my sister's phone number. Cyndi actually took the time and asked about my health conditions and showed concern. When I'm over all my issues, I plan on making a trip to San Diego and staying at this house. My goal is this review. Thank you, thank you, thank you for being such amazing guests and so very pleasant. So sorry Gail you could not make it, but I so very grateful for you choosing my home and that your family could come and stay. Come back when you are feeling better. Would love to have you anytime. This amazing property is exactly as wonderful as it looks in the pictures. So very relaxing and in an ideallic location, it is everything our family needed to enjoy our working holiday. Spectacular, comfortable, a must 'stay property'! This is a five star review at every level. The property is exactly as pictured on their web site. In all honesty, it is even better than pictured! The views of the bay from the living room and kitchen are spectacular any time of the day. We watched sunrise from the comfort of the couch or out on the patio each morning. We took a two minute walk each evening to the ocean side to enjoy sunset and all the activity that comes with life on the ocean side. There is everything one needs to prepare meals at home. The shower is great--come on now, you know that is important. The property is spotless-whether you are in the kitchen, bedrooms, bathrooms, living room or even on the patio. Another important feature is location, location location. There are restaurants, bakeries, coffee houses and bike/scooter rental stores all in walking distance from the property. We were within a 25 minute drive from any major attraction. The property manager, Cyndi is great. She was most helpful with the entire rental process. She met us as we drove up to the property on the first day. She lives nearby but she is a hands off manager-only there when needed. Going back home feeling refreshed, energized and counting the days until next year. We are already planning our return trip for December of 2019! Oh you both were amazing too. I loved meeting you both and having you as my guests. I cherish great guests and you both will be in my heart and memory. Hope to see you next December. Very, very clean and well appointed. Great location. Loved the comfy king bed, especially appreciated by my 6'6" husband. Quiet. Especially attentive, accommodating and gracious landlady and her husband. Thanks for a lovely week. We'll be back. What wonderful guest you both were at our vacation rental. We love having guests such as yourselves, who are respectful, fun to work with and add so much to this business. I am a blessed business owner. The house & area was perfect! We will definitely visit again! Loved having you as guests. Many seasoned vacationers prefer the bayside to the ocean front for its quieter nature and easier access for families with small children to play right out front of your patio. This beautifully remodeled two bedroom, beach and waterfront rental, called The Kingfisher, is unique in that it is surrounded by water with both the Bay just out your front door and the ocean just steps away to the west. There are miles and miles of gorgeous sandy beaches for exploring, strolling, sitting and playing at for your pleasure. We are famous for our beaches, our culture, our diverse restaurants, San Diego Zoo, proximity to Mexico, outdoor activities, and our natural beauty as a city. There are world class golfing, fishing, sailing, museums and theater all through out the year. We are a leading area for conventions and attract many corporations which hold their annual meetings at our downtown convention center. Golf: We are located near the world class greens of Torrey Pines, just minutes away for your golfing adventure. There are also other golf choices nearby too. ~Rate charges are: Rent City Hotel Tax Cleaning fee Refundable damage deposit $500.00 Administration fee HomeAway Service fee is separate from our charges. ~We send a contract from our business email address and ask that any guest 18 years and older read the contract and initial ~We ask that you read the enter website before requesting to book, so you are aware of the information.